.Traditionally, a chemical method such as PEG has been used to fuse cells together (to an equivalent 2 or 3 orders of magnitude). Inactivated viruses have also been used for the same effect. More recently, methodologies combining successive AC and DC electric fields have further improved the efficiency of cell fusion, in some cases as much as 30-fold higher.Somatic cell fusion is an involved technique traditionally used for making hybridomas for monoclonal antibodies. This technique fuses an immortal myleloma cell line with a spleen-derived antibody-producing B-cell. The hybridoma cell line produced will stably produce a specific monoclonal Ab for months or years. Cell fusion has also been used to study gene expression and cancer progression. For instance, ES/EG cells have been fused to T-cells to study T-cell activation by reprogramming pluripotent stem cells. This application also assists the amplification of viral particles in non-host cells, or can be used to study how a cell divides, and has been used to great success to fuse Oocyte and somatic cells. There are other lesser known applications such as fusing yeast and mould cells, plant protoplast electro-cell fusion. The control available through using the ECFG21 presents a reproducible and efficient technique for researchers to create their own hybrid cell line . The ECFG21 is our latest improvement on and replacement of our LF201 device. The ECFG21 is the only device on the market to currently provide real-time monitoring of the delivered voltage and current ouputs. This information enables the researcher to fully control each sample and ensure its optimal condition for cell fusion. The ECFG21 operates a simple two-step technique. Firstly, it applies an AC pulse to physically align the cells (end-to-end in a chain formation). When the cells are aligned, it then delivers a series of DC pulses which disrupts the plasma membrane and induces fusion of adjacent cells. Throughout the next 30 minutes as many as one in every hundred cells makes a viable hybrid cell with two nuclei. The ECFG21’s operation completes when the nuclei later fuse. 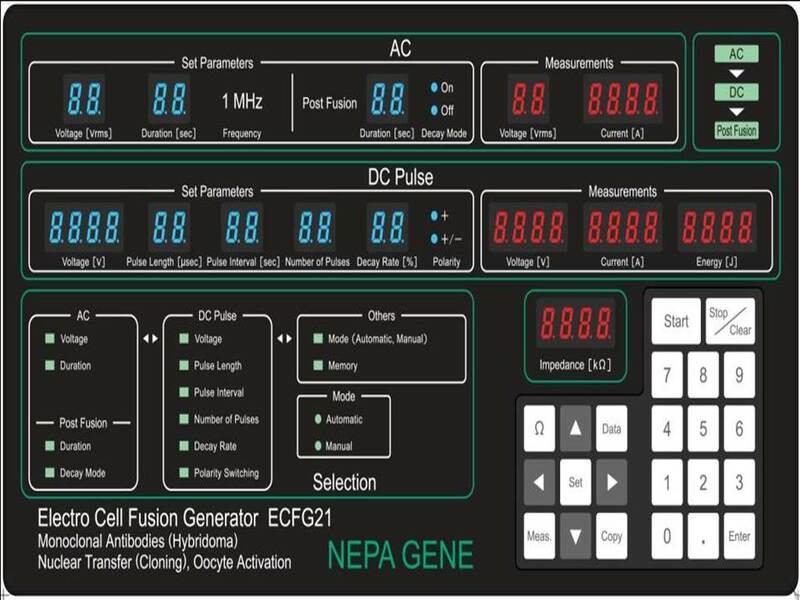 The significance of the ECFG21 for your laboratory is that it can precisely control: – the AC to DC switching time – the DC pulsing amplitude and length (including a convenient reverse polarity option) – post fusion AC current for maintenance of the end-to-end cell configuration and – manual control of DC pulsing which is useful when observing first time cell optimizations under a microscope. Unique to the ECFG21, it has a polarity switching function which the researcher can choose to apply or not apply depending on preference. Clients have reported that the ECFG21 provides a much more enhanced control of experimental conditions as compared with chemical and viral methods. An example is the control it gives the researcher over determining if a sample’s ionic conditions are not optimal or compromised. As a high ion concentration in a sample solution (creates a physical streaming in the sample solutions and thus) disrupts the cell chains it is very useful and important that the researcher can monitor in real-time the delivered electric fields can make a call in real-time if ionic conditions are not optimal. 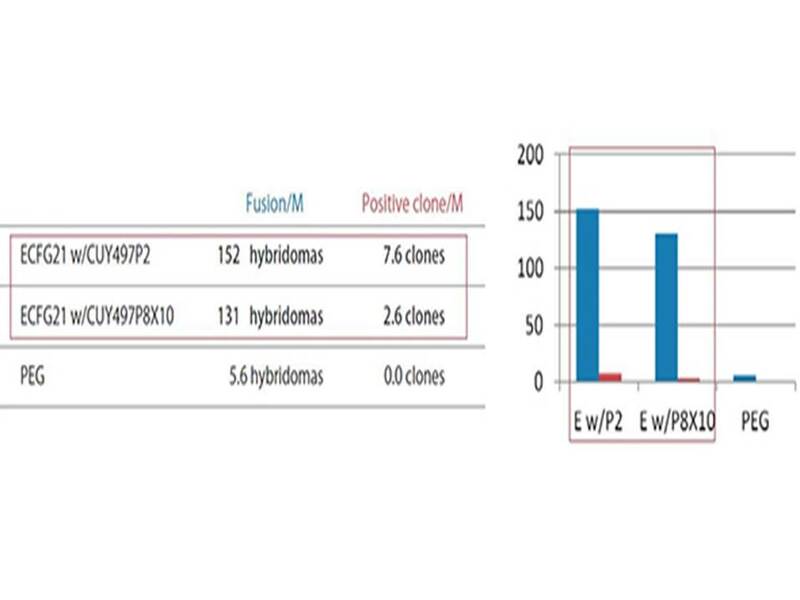 Electro-cell fusion with the ECFG21 invariably produces hybrid cell lines that are more stable (due to lower cytotoxicity – as a result of not using PEG -and the precise electric field and pulsing control of the device. Results also tend to be more reproducible and repeatable. Dramatically higher Fusion Efficiency compared to PEG! ● Tetraploid embryo complementation Two-cell embryos for Tetraploid Chimeras ES/iPS-cell-derived Mice . 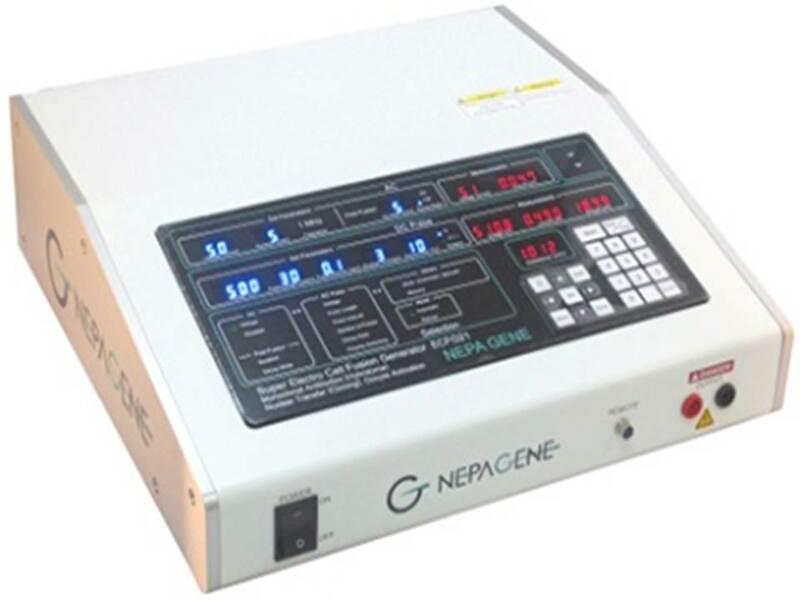 .ECFG21 is the world’s first fusion device that can in real-time measure and record the delivered voltage and current of the AC pulse and the voltage, current and joule of the DC pulse. This real-time information greatly assists the researcher optimize experiments and achieve higher fusion efficiency with lower cell damage. .The new user interface is much improved compared with our old LF201 fusion generator. The intuitive operating display makes it possible to visually set and review all the electric parameters of BOTH the alternate current (AC) pulse and the direct current (DC) pulse. 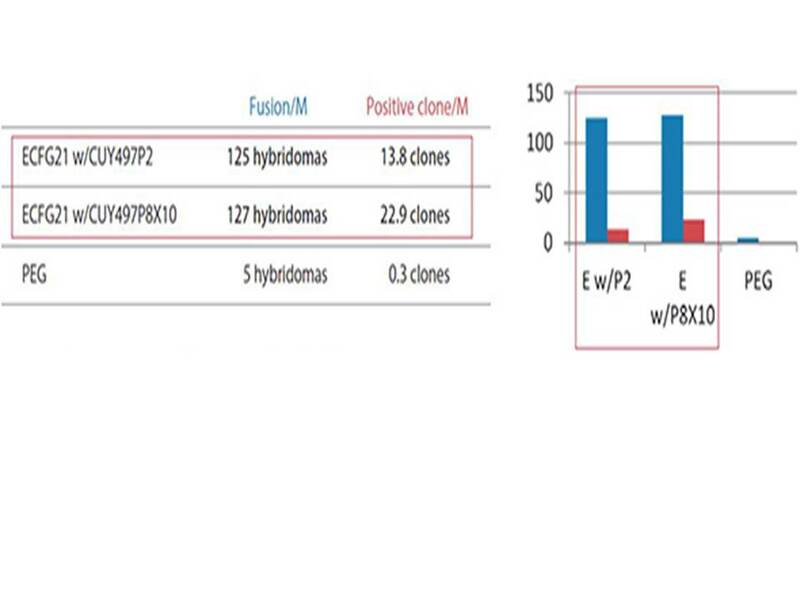 ..The fusion efficiency achieved by the ECFG21 for hybridoma production is dramatically higher than PEG. The ECFG21’s improved electrode chamber offers a large volume solution (up to 8ml) than was previously available with the LF201. 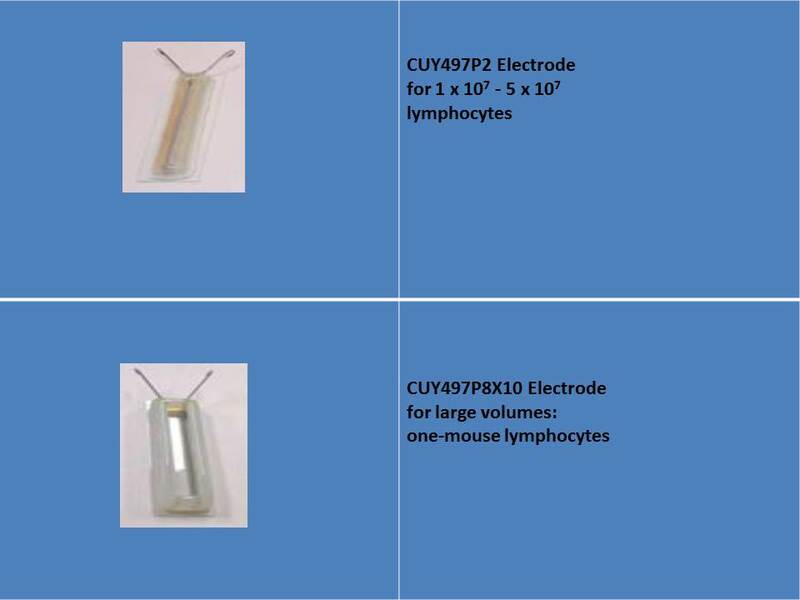 The new electrode chambers correspond to a large volume solution (one-mouse lymphocytes).. The AC is applied so that the cells are aligned in a chain for touching on each side; “Pearl Chain” Formation . The aligned cells are high-efficiently fusioned by the 2-step DC pulses with voltage decay (multiple pulses from setting a decay rate and a polarity switching). . The post-fusion AC is applied so that the fusion process begins to mature and high fusion efficeincy is achieved with low cell damage. . The efficiency by the ECFG21 is 25-100 times higher than PEG. 3) Antigen used: Highly hydrophobic 17 amino acid peptide. ……….. …………………………………………………………………………………… Two-step cloning procedure to produce mice from cancer cells. Different tumor cells were used as donors for nuclear transfer into enucleated oocytes. Resultant blastocysts were explanted in culture to produce ES cell lines. 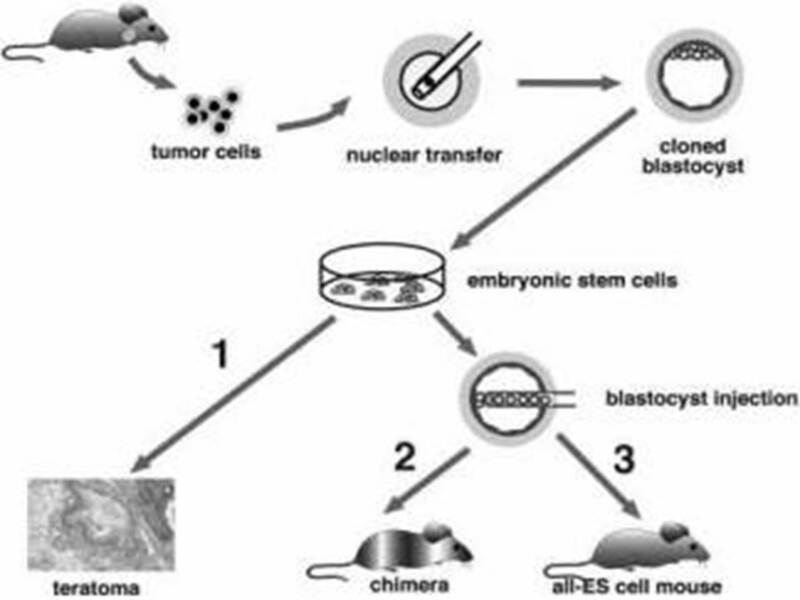 The tumorigenic and differentiation potential of these ES cells was assayed in vitro by inducing teratomas in SCID mice (1), and in vivo by injecting cells into diploid (2) or tetraploid (3) blastocysts to generate chimeras and entirely ES-cell-derived mice, respectively. …..Genes Dev. 2004 Aug 1;18(15):1875-85. Hochedlinger K et al., Whitehead Institute for Biomedical Research, and Department of Biology, Massachusetts Institute of Technology .
. High speed camera images of the fusion process This fusion process is almost instantaneous. 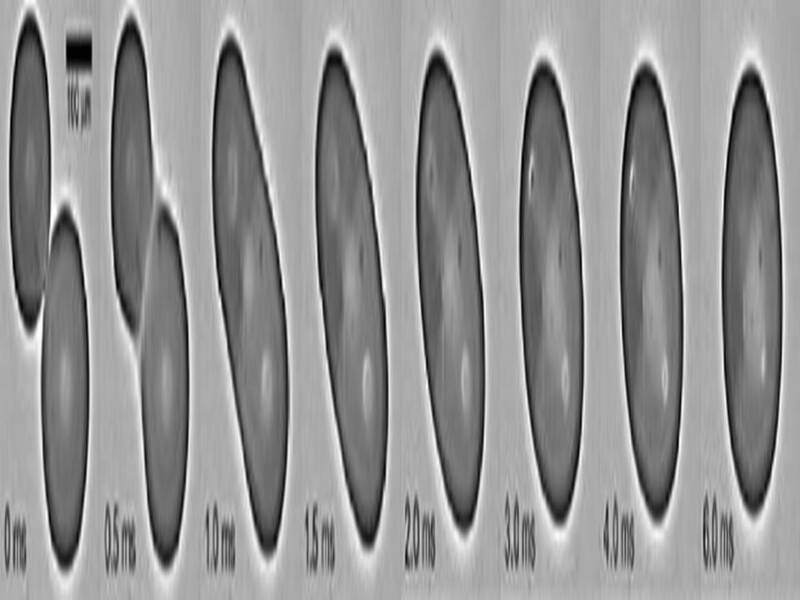 The two droplets combined into one single ”peanut-shaped” droplet within about 1ms. It took about another 5ms for the droplet to adopt a spherical shape under the effect of surface tension. Throughout the fusion process, the darker colored blue ink droplet (leftmost) was distinctly separated from the lighter colored water droplet (rightmost). . Lab Chip. 2006 Jun;6(6):757-63. Epub 2006 Mar 31. Tan WH, Takeuchi S., CIRMM/IIS, Institute of Industrial Science, University of Tokyo . 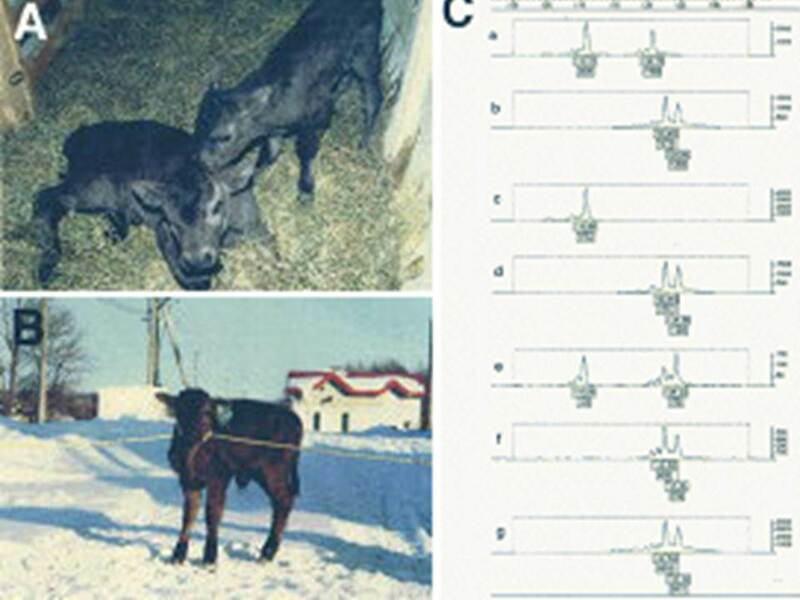 Photographs of calves obtained after nuclear transfer. A: Two days after birth B: Four weeks after birth C: Fingerprinting of DNA from cloned calves, recipient cows, and donor ES-like W3 cells. Electrophoretograms show amplified fragments of DNA derived from leukocytes from recipient cows (panels a, c and e) and cloned calves (panels b, d and f) and from donor ES-like W3 cells (panel g). Upper and right-side scales indicate the sizes of DNAs (bp) and the intensities of DNA fragments, respectively. Numbers in boxes indicate the sizes of DNAs (upper) and the intensities of DNA fragments (lower). After insertion of donor ES-like cells into the perivitelline space of oocytes, cells and cytoplasts were fused electrically in fusion medium. (DC: 20V, Pulse length: 50us, Pulse interval: 100ms, 2 Pulses) . Biochem Biophys Res Commun. 2003 Sep 12;309(1):104-13. Saito S et al., Saito Laboratory of Cell Technology, Japan . .One of our clients has recently reported very favourable results using the ECFG21 for Hybridoma Production for Monoclonal Antibody.Please note his comments:“We used over 30 immunized mice for acquiring the data. Please note that this is a flow based data. The actual efficiency of mAB producing hybridoma will be expected to be lower since ~50% of lymphocytes are B cells and not all fused hybridomas will express antibodies. The flow based analyses were carried out after the fusion. 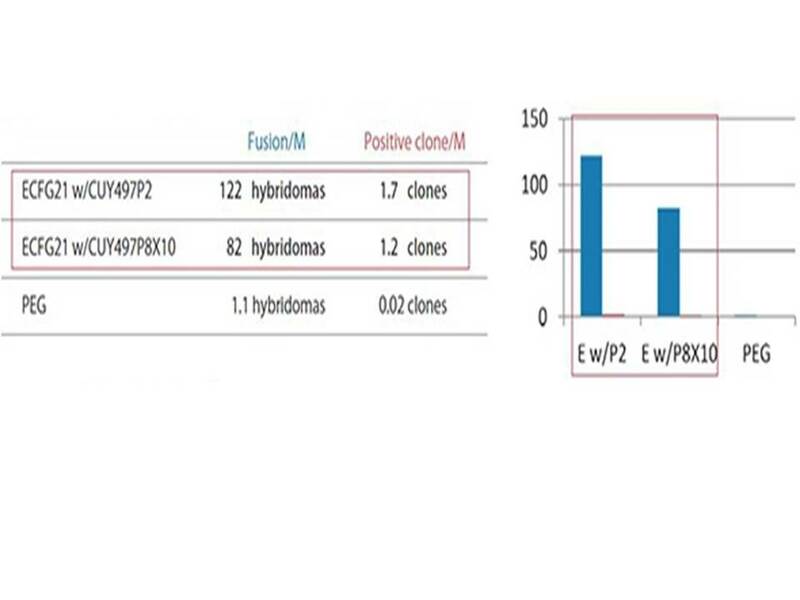 As you can see there were ~4-fold difference in the number of hybridoma generation between PEG and electrofusion. As you indicated, the cell death % in PEG is high approaching ~50%, while the rate for electrofusion was 15-20%. Taking these into account, I think there is easily 6-fold difference in the fusion efficiency. In our actual experiment, we experience at least 10-fold higher number of hybridomas being generated. At lease, with the flow based assay, the electrofusion results look very promising..”DOWNLOAD the presentation: ECFG21 Electrofusion Optimisation for Hybridoma Production for Monoclonal Antibody.